Yesterday's holo gave me holo fever. I have so many holos, but I have to be honest I rarely wear them. It's not because I don't like them, it's that holo dry spell I talked about yesterday. Holos were so rare at one time I didn't want to use mine in fear of them going away forever! I haven't gotten over it, but I should break them out more because they're stunning. The ILNP I have for you today is an incredible stunner. 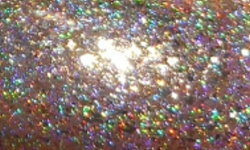 Fame is a champagne gold holo with metallic gold and silver flakes. Color: This is a stunning color. I love gold holos and gold glitters, but sometimes they don't look great on my skin tone the more yellow they are. Fame is a great alternative. This is a gold-toned polish, but it's cooler toned and lighter. The holo in this is intense and eye catching. The addition of the metallic flakes just is icing, sprinkles, cherries, and whipped cream on the already amazing cake. Formula: Excellent and easy to use formula. I used 3 coats above. Overall: Must have. Amazing. Stunning. Spec-freaking-tacular. This will definitely be a contender in my Top 25 of 2015. You need this one. I totally know what you mean about not wanting to use your holos! I think we have PHSD (pre holo stress disorder) or something. We are survivors of the Great Holo Drought. I still have very few holos as a lot of them are hard to get here, so I also end up hardly ever wearing them! When I do though, WOW! Bling!! This is so pretty!